Nobody wants to waste food, but it happens both at the individual level (“Whoops, forgot about that lasagna in the back of my fridge”) and at the production level. Tyson, the chicken company, hopes to save poultry scraps that might otherwise go to waste by “upcycling” them into “protein crisps” recently launched under a new brand called Yappah. Oh, and the company would really like it if you’d back the idea on IndieGogo. The crisps, which kinda look like miniature rice cakes, come in flavors including Chicken Celery Mojo and Chicken IPA White Cheddar. Some use spent grain from the beer-making process—a product typically thrown away or fed to livestock—and leftover vegetable matter, in addition to “upcycled chicken” from Tyson’s own poultry products. Upcycling, for those not in the know, is a fancy way of indicating that an old product was turned into a new product. It’s like recycling but... buzzword-ier. “Tyson Foods provides upcycled chicken breast trim that is still full of flavor and protein and combines it with either rescued vegetable puree from juicing or rescued Molson Coors spent grain from beer brewing to create the line’s four flavors,” Tyson says in a release. 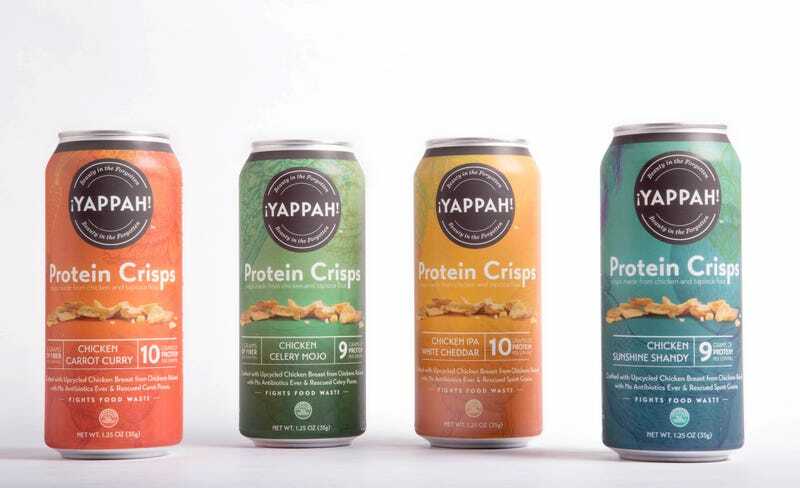 Anyway, should you be totally into the 8-plus-grams-of-protein Yappah snacks, you can back their crowd-funding campaign in exchange for cans of the snacks as rewards.